UPDATED! Microsoft has finally revealed the release date for the Xbox 360 Elite in Europe and it quite nicely coincides with the Bioshock release date. Microsoft is finally addressing cooling issues for the 360, by sneakily adding a heatsink to the interior. CES 2007: Gates espouses Vista and Office, and demos a whole bunch of new functionality for Xbox 360 - as well as a voice activated kitchen. Scott Adams, the cartoonist behind the Dilbert comic, is rallying for Bill Gates to go for Presidency. Will the Lord of Windows become the head of America? Retail versions will now not arrive until early 2007. Couple that with layoffs and lawsuits, and this hasn't been a good start to Bill's week. Microsoft's main man tells an American newspaper he likes to watch ripped content on YouTube. Golden. The world is over! Well not quite, but the times are certainly a-changing. Gates is off to do charitable works full time. 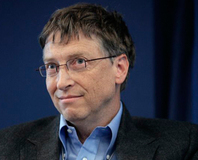 When Bill Gates wrote his vision of the future back in 1995, he made a number of outrageous (at the time) predictions about what the digital world would be like in 2006. How have his predictions held up? We take a look back at the book and see what Gates got right and what he got wrong. CES 2006: Bill Gates has been demonstrating the media features of Windows Vista in his keynote speech this evening.